Spent a lot of time yesterday creating a new blog gallery here on WordPress for Bob’s viking age creations. Anyone that has read my About Me page will know that Bob is my other half. He’s a wonderful sword and silversmith and has a website already, but we wanted to provide a better gallery for the beautiful things he makes. Took a bit of time and effort, but I think it was well worth it!! Take some time out; make a cuppa, draw up a chair and enjoy!! Welcome to Vikingswords.net; my name is Bob Davies. I have a keen interest in history and metal working, particularly in the viking era. I trained as a silversmith at the School of Jewellery, Birmingham, and from this I progressed to making viking age jewellery based on various archaeological finds from Europe. Over the years I have developed my skills as a metalworker to produce swords, seaxes and silverware, mainly for use in the re-enactment world. I strive to produce quality items that are durable, feel right in the hand, look pleasing to the eye and are correct for that period. The swords, seaxes and silverware pieces are individually hand crafted by myself. Silver pieces, like the arm-rings and bangles are made using traditional techniques as they were in the viking age. The coinsare hand stamped on coin dies made by myself. Bread and Cheese …….. updated! 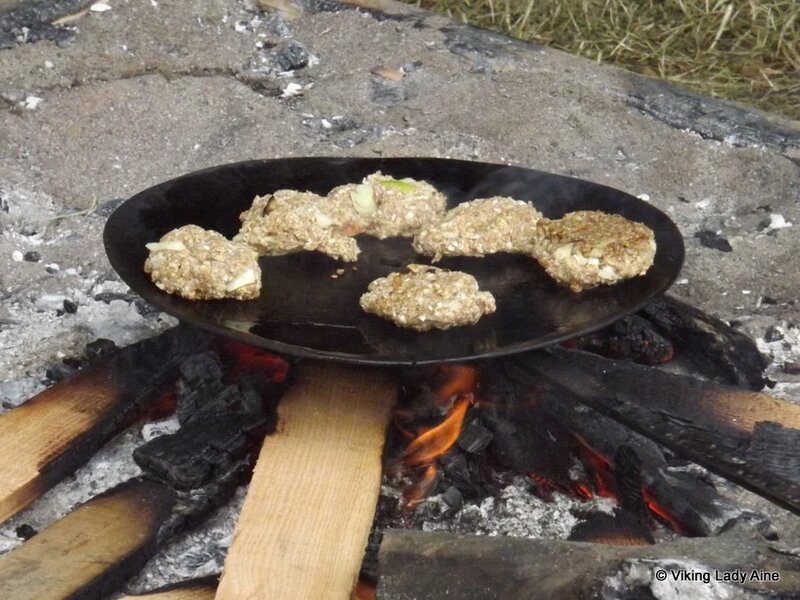 When we were at the Corfe Castle event I wrote about making bread viking style. Last weekend I had a chance to try this out myself when we were at a Fingal Living History event held in the grounds of Malahide Castle near Dublin. I had the basic recipe that I had used in the past, and after watching the Manaraefan ladies cooking some, I was pretty confident that this would work. I used spelt flour (purely because I use spelt rather than wheat in all my baking). For measurement purposes I used a 2 cups to 1 ratio of white to brown flour. I added some yeast and some crushed garlic, and then used just enough warm water to bind it together to create the dough. Then I divided the mixture into small balls and left for about 15 minutes until it had risen a little. To cook the bread I just placed the bread balls onto the pan and cooked over the fire. A word of warning; you need to be careful with the heat from the fire. If the pan is directly on the fire, the bread may burn on the outside before it is cooked. Also, dust the pan with a little flour to stop the bread from sticking to the pan. You know the bread is cooked when you tap it and it sounds hollow. For the second batch I actually cooked it on the griddle suspended over the fire. I also made the cheese/butter spread I had been shown at Corfe. I took half a block of butter and allowed it to soften enough that I could mix the same weight of Cashel Blue cheese through it – delicious. No picture though – it got eaten before I could take the photo!! Meanwhile over at the FLHS kitchen the girls were also cooking bread. Their bread mixture was made with oatmeal and apple. I’ve done this in the past where I’ve added some pinhead oatmeal to the bread mixture. This was fun to do and quite easy to make………. 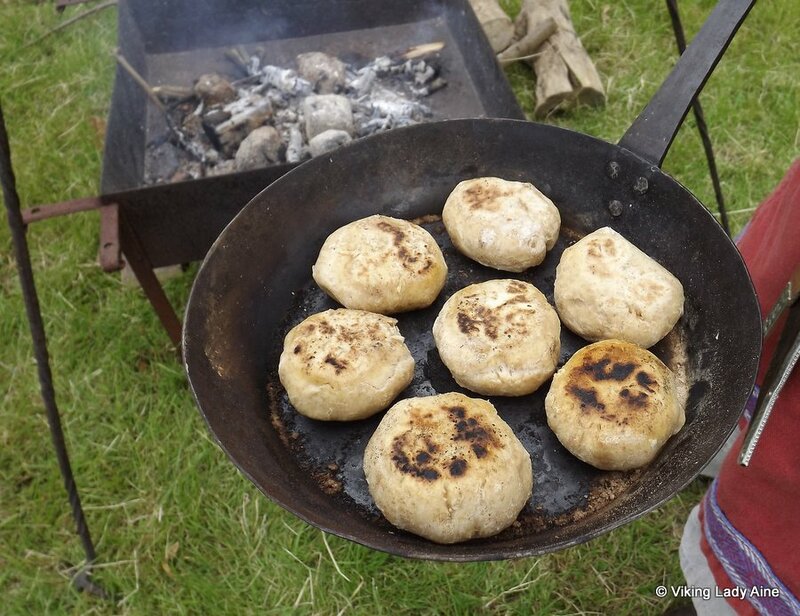 Posted on June 24, 2013 Categories Viking Camp LifeTags blue cheese, Bread, camp fire cooking, craft, Fingal Living History Society, food, history event, Re- enactment, Viking1 Comment on Bread and Cheese …….. updated! We were lucky to attend an event hosted by Hrafnslith in Corfe Castle near Poole in Dorset at the beginning of May. The weather for the weekend was absolutely amazing; glorious sunshine all day long. It made for wonderful days re-enacting! But there was something else we hadn’t expected. The warmth of the days created mist and fog in the mornings. When we got up the castle itself was almost completely obscured by the mist. I loved the way the battlements and the viking village appeared to merge into the mist. There was great heat in the sun and the mist disappeared quite quickly; but the images were pretty spectacular. Here are a few more photos of that beautiful morning. In 1904 a viking burial mound containing a viking ship was discovered at Oseberg in Norway. The grave contained two female skeletons and an array of grave goods. Irish archaeology have a great post on their blog which outlines the burial and the finds; they also have some great photos. My main interest in the Oseberg ship is purely selfish! And if you have ever camped you will fully understand why I was so interested in them! There is nothing worse than waking in the morning after having spent the night on the cold damp floor of a tent. Yes, we had beds and coverings to make life more comfortable, but we were on the ground. I’m no spring chicken any more and I like a bit of comfort when I’m away. So Bob and I had a wee chat, and over one winter he built us a bed. It is based on the Oseberg design, but the ornate carvings on the corner posts were not really an option as our little A-frame tent wasn’t big enough to accommodate that. Our solution was to make the bed ends without the carvings. 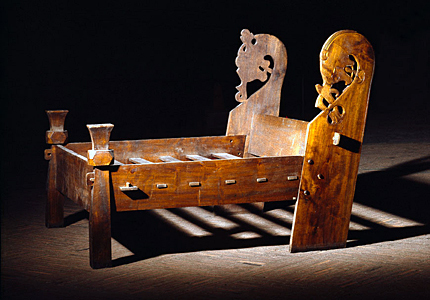 To be honest it’s a bit more like the Gokstad bed, also discovered in Norway (in 1880). Here are a couple of photos of the bed assembled in the tent. You can see that if we had the carved ends then they would have pushed hard against the canvas. The bed is flat pack. We joke that there is a reason that the Swedes have Ikea…….. and that the vikings were the first ‘flat pack people’! It makes sense, as the bed packs away easily for transport. I’ve included a couple of photos of how the bed slots together at the corners. When it’s all assembled, we cover it with our sleeping skins. Looks pretty comfortable – and trust me…….. it is! Another great thing is that it increases our storage space as we can use the space under the bed. Bob swears he should have made one years ago. Just proves my point; it takes a good woman to sort these viking lads out!! 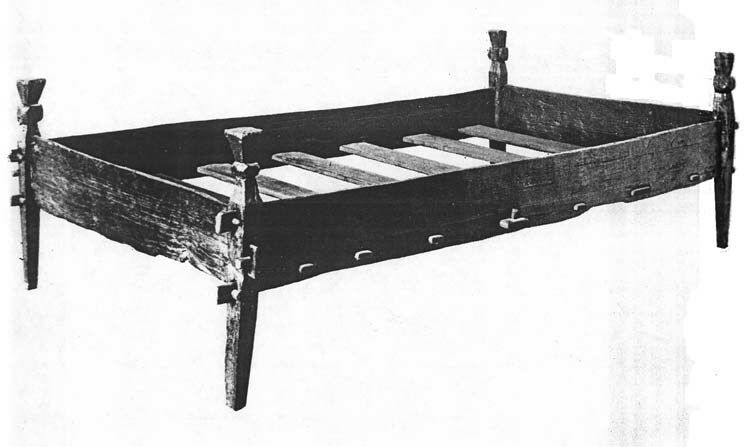 If you’re interested in making one of these beds yourself, there are some plans here on livinghistory.co.uk. Some of the viking shows have kiddy vike. What’s that? Well, it’s a chance for kids to pretend to be vikings and line out against the big bad bearded warriors; not just the viking kids, but also the public. It’s usually for any child under the age of 13 who (with their parents permission) wants to learn to be a viking fighter. It can be quite daunting for a viking to face a fearless mini warrior; these kids have no sense of fear and have no doubts about tackling grown fighters and whacking them on their shins! The kids are given wooden weapons and shields, and are also given basic instructions on attack and shield walls. The vikings form a shield wall; this is their basic defense formation. After some basic training for the kids chaos ensues; it’s attack time! 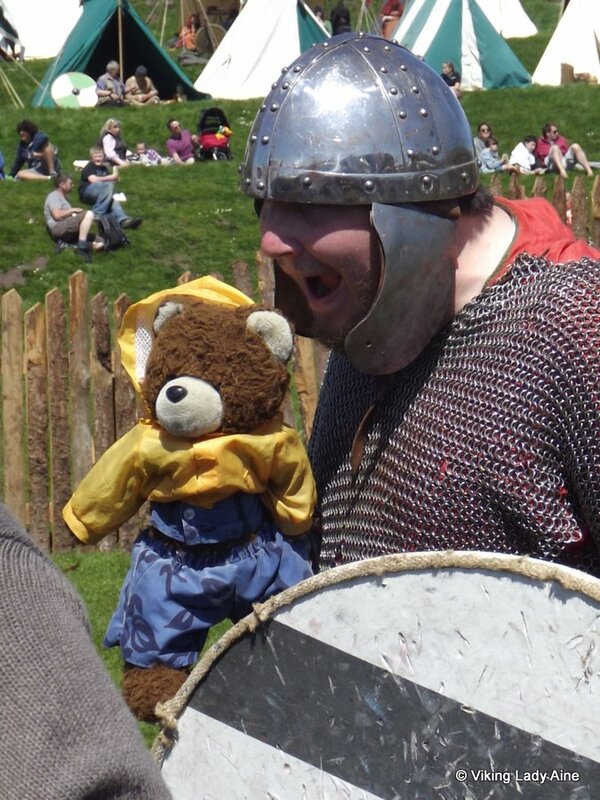 And even a teddy bear isn’t safe from the vikings! It’s all done with fun in mind; the aim is to get kids interested and create an interaction between the child and the viking warriors world. Perhaps it might even interest some of them (and their parents) to become involved in the Viking Re-enactment scene. Viking Raid in Corfe Castle! 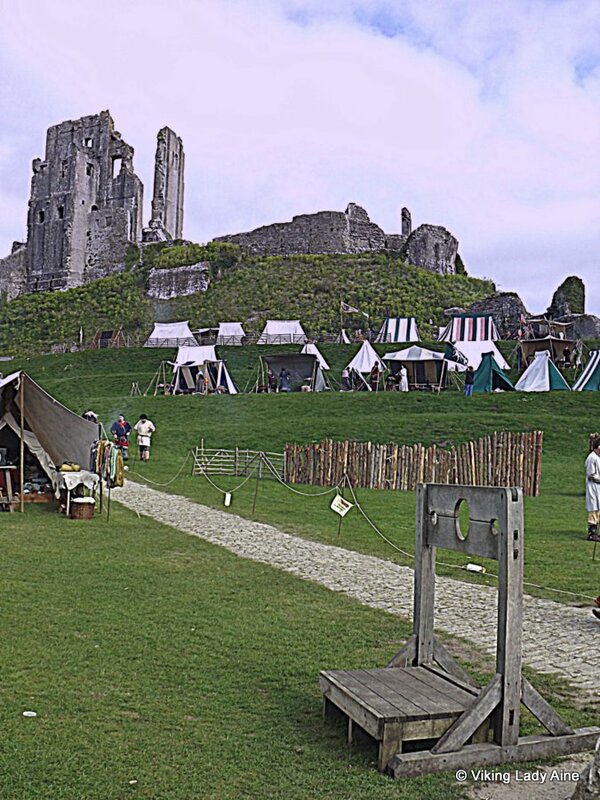 Recently we were able to attend a wonderful viking event in England held in Corfe Castle, Dorset. The show itself was organised by the group Hrafnslith (or ‘Troop of the Raven’) lead by their leader Thurstan the Shoeless, assisted by his sidekick, Alric of Weldham. A full day of events included an opening skirmish between the Vikings and the Saxons, the Kings Court (where justice was dispensed on a number of crimes! ), kiddy vike, and Saxon and Viking encampments. The weekend show re-created events surrounding ‘The Alliance’ between the Saxons and the Brythonic Kings as a response to the arrival of the Danish ‘Great Army’. (The Brythonic were the Welsh, Cornish and Breton Celts). King Alfred has gathered his allies and the army of Wessex at Corfe Burgh ready to march on Exeter, which has been recently captured and sacked by the Vikings. The Vikings take the initiative and head to Corfe in the hope of striking an early blow whilst the alliance is still forming. 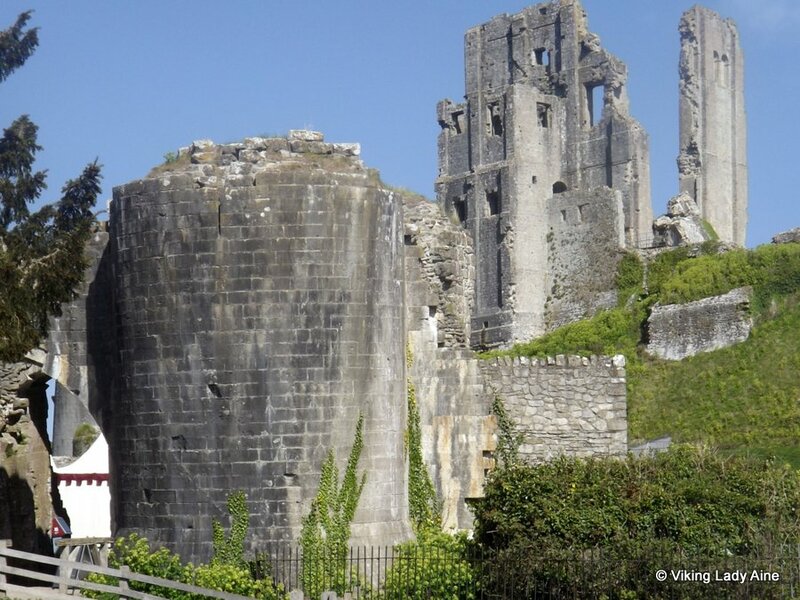 (For those of you that are true historians, this is fiction; the castle was actually built by William the Conqueror in 1090, and before the castle was built, the area was know as Corfe Gap. 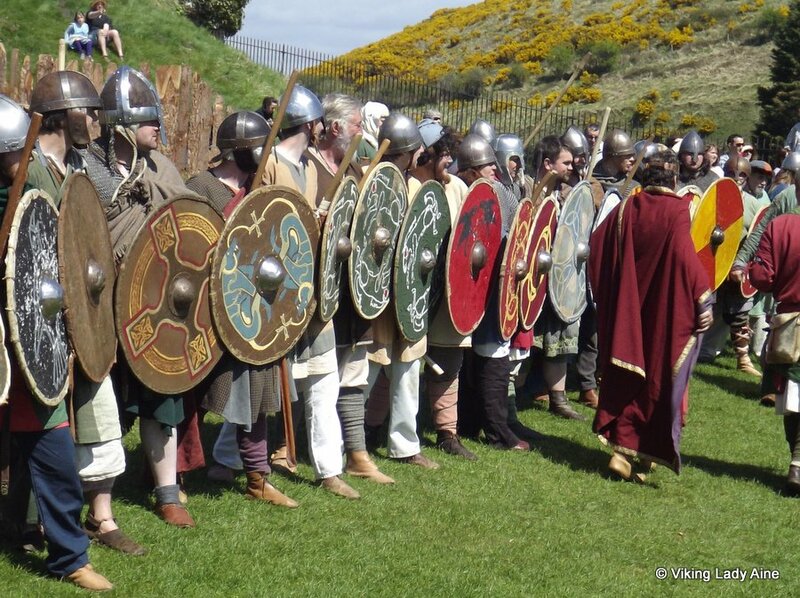 However The Vikings Society needed an excuse to have a battle on the May Bank Holiday – so here we are). 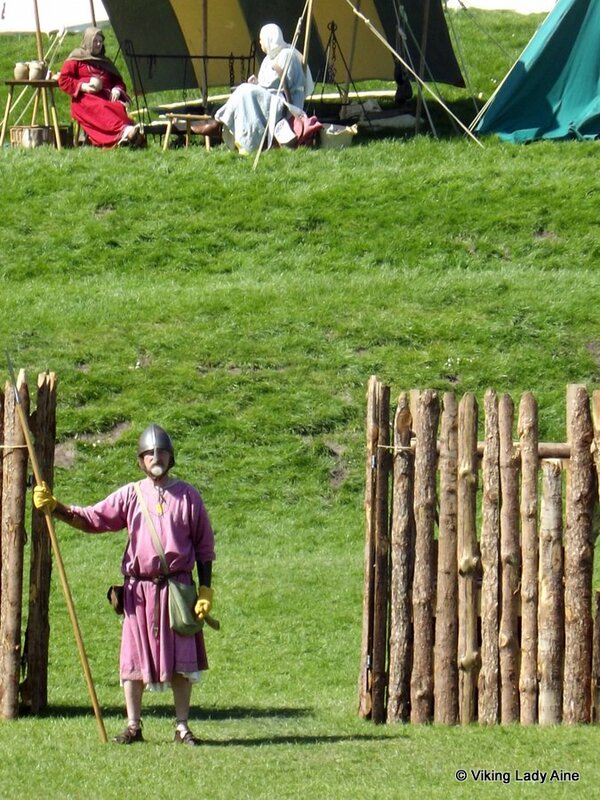 I’ve included a few photos below to give an idea of the living history encampment within the walls of the castle ruins. The Saxon camp was laid out behind the palisade on the stepped tiers up to the castle. One of the highlights of the days events was the Saxon – Viking battle. The warriors mustered in the village square, and then marched into the castle grounds, where the battle re-enactment was staged. In previous posts I’ve mentioned that the weapons used are blunts, but believe me when I say they can still do some serious damage in the wrong hands. Only after hours of training and assessment can the warriors take the field. The photos below show some of the fun the warriors have….. This has to be one of the best viking events we attend. Hrafnslith are wonderful hosts, the setting is spectacular and the castle is an amazing place to visit even if the vikings aren’t around!! Posted on May 14, 2013 August 11, 2013 Categories Viking AdventuresTags Anglo-Saxons, battles, Corfe Castle, Dorset, encampment, history encampment, living history, NFPS, outdoors, photography, Re- enactment, Saxons, sword fight, Viking1 Comment on Viking Raid in Corfe Castle!